For the retractable hardtop in automobiles, see Convertible. A retractable roof is a roof system designed to roll back the roof on tracks so that the interior of the facility is open to the outdoors. Retractable roofs are sometimes referred to as operable roofs or retractable skylights. The term operable skylight, while quite similar, refers to a skylight that opens on a hinge, rather than on a track. Retractable roofs are used in residences, restaurants and bars, swim centres, and other facilities wishing to provide an open-air experience at the push of a button. The United States Patent and Trademark Office (USPTO) shows that David S. Miller, founder of Rollamatic Retractable Roofs, filed a patent in August 1963 for a movable and remotely controllable roof section for houses and other types of buildings. As Rollamatic was founded five years earlier, the first installation of a motorized retractable roof must be between 1958 and 1963. While any shape is possible, common shapes are flat, ridge, hip-ridge, barrel and dome. A residence might incorporate one or more 3' by 5' retractables; a bar or restaurant a retractable roof measuring 20' by 30'; and a meeting hall a 50' by 100' bi-parting-over-stationary. Stadium retractable roofs are generally used in locales where inclement weather, extreme heat, or extreme cold are prevalent during the respective sports seasons, in order to allow for playing of traditionally outdoor sports in more favorable conditions, as well as the comfort of spectators watching games played in such weather. Unlike their predecessors, the domes built primarily during the 1960s, 1970s, and early 1980s, retractable roofs also allow for playing of the same traditionally outdoor sports in outdoor conditions when the weather is more favorable. Another purpose of retractable roofs is to allow for growth of natural grass playing fields in environments where extreme hot and/or cold temperatures would otherwise make installation and maintenance of such a field cost prohibitive. Installations throughout the world employ a variety of different configurations and styles. Civic Arena, built in 1961. 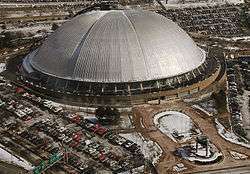 The first retractable roof sports venue was the now-demolished Civic Arena in Pittsburgh, Pennsylvania, United States. Constructed in 1961 for the Pittsburgh Civic Light Opera, the arena was home to minor-league and NCAA D-1 basketball and ice hockey teams before becoming the home of the NHL's Pittsburgh Penguins in 1967, as well as hosting over a dozen regular season NBA games in the 1960s and 1970s. The arena's dome-shaped roof covered 170,000 square feet (16,000 m2) and was made up of eight equal segments constructed from close to 3,000 tons of steel, in which six segments could retract underneath the remaining two, supported by a 260-foot (79 m) long exterior cantilevered arm. Olympic Stadium in Montreal, Quebec was slated to be the first outdoor retractable roof stadium at its debut for the 1976 Summer Olympic Games. However, plagued by construction problems, the roof was not installed until 1987, and was not retractable until 1988. Even then, movement of the roof was impossible in high wind conditions, and technical problems plagued the facility. A permanent, fixed roof was installed in 1998. By contrast, the Rogers Centre (formerly known as SkyDome) in Toronto, Ontario had a fully functional retractable roof at its debut in 1989. Miller Park, with a fan style roof. 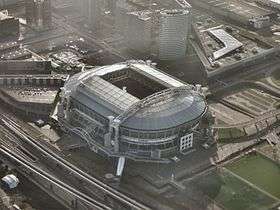 Architecturally speaking, retractable roofs vary greatly from stadium to stadium in shape, material and movement. For example, Miller Park has a fan style roof, while Toyota Stadium in Japan has an accordion-like roof. Most retractable roofs are made of metal, while some, such as the roof of University of Phoenix Stadium, are made of water-resistant fabric. Although each retractable roof differs in these aspects, Safeco Field's roof is unique in that it is the only one in North America that does not form a climate-controlled enclosure when in the extended position; rather, it acts as an "umbrella" to cover the playing field and spectator areas during inclement weather, with no side walls enclosing the stadium. In North American major sports leagues, specific rules exist governing the movement of retractable roofs before and during gameplay. These rules vary between the NFL and MLB, as well as from stadium to stadium. In general, if a game begins with the roof open and weather conditions become less favorable, the home team may, with the approval of the field officials and visiting team, request the roof be closed. (Such a scenario is generally rare, due the accuracy of modern weather forecasting and a general err on the side of caution that keeps a roof closed if there is any significant threat of precipitation.) Depending on the stadium, weather or gameplay conditions, and the judgment of the officials, play may or may not continue until the roof is fully closed. If the game begins with the roof closed, it may be opened under some circumstances depending on the venue. If it is closed after the game begins, typically it must remain closed for the duration of the game. Open roof system used by facility construction company. Some modern athletic facilities are using affordable, less complex roof systems that resemble retractable roofs in appearance and effect. These roof systems, commonly referred to as open roofs, are constructed with similar materials as retractable roofs. Most open roof companies offer polycarbonate or tempered glass roofs for safer sports play and durability. Hinged at the structure's gutters, open roofs fully close and open by the mechanics of a rack and pinion system or a push/pull drive system. Comparable to the benefits of retractable roofs, open roof systems offer players year-long usage, protection from inclement weather when needed, and the feeling of an outdoor environment. Open roofs are typically seen at smaller athletic venues such as country clubs and universities. Both retractable roof and open roof systems are also used in the construction of commercial greenhouses and garden centres for climate control purposes. ↑ "McGraw-Hill Dictionary of Architecture and Construction". thefreedictionary.com/. McGraw-Hill. Retrieved 11 June 2014. ↑ "United States Patent and Trademark Office". uspto.gov. United States government. Retrieved 11 June 2014. CBC archives The architect explains the roof system for the Rogers Centre (then called the skydome) in Toronto. CBC Archives A clip from 1975 where the stadium architect talks about his design for the Montreal Olympic Stadium. CBC Archives A look back on the history of the Montreal Olympic Stadium (1999).